RUSH: Grab audio sound bites 4 and 5. David Asman — who, by the way: condolences. His father just died. His father was an amazing media figure in and of himself, Robert Asman. He just passed away. David Asman’s a reporter at Fox, Fox Business. He’s been there for quite a while. He was on the After the Bell program yesterday, cohosting, and he had as his guest the executive editor for the Weekly Standard, Fred Barnes. And they were talking about me and my comments about the special counsel Robert Mueller and his investigation into Trump. To start things off, Asman introduces and plays a clip of me from yesterday’s program. We have two bites here with Asman setting it up and then the second bite will be Barnes. Here’s the first. ASMAN: — that it’s just a witch hunt, at this point. Rush Limbaugh, by the way, spoke to this point earlier today. ASMAN: Let’s just play the sound bite and get your response. Go ahead. 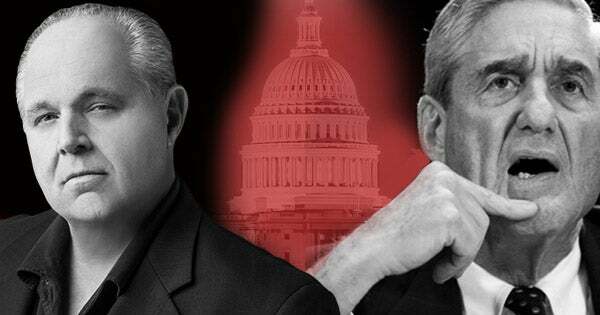 RUSH ARCHIVE: The Mueller team is comprised of not faithful and nonpartisan, objective, law-abiding investigators. It is populated by Trump-hating, pro-Hillary, pro-Obama partisans who have been given unlimited money and unlimited purview to use the power of the federal government to impediment their political ideas, not enforce the law. BARNES: I think he exaggerates a little, but certainly not entirely. I mean, look, the original hires by the special counsel there, Robert Mueller, were people who had been Democratic donors. One of them was a lawyer for the Clinton Foundation. These were people who came with a partisan tilt. Why they were hired, I don’t know. But it was clear who they were, what they’d done. 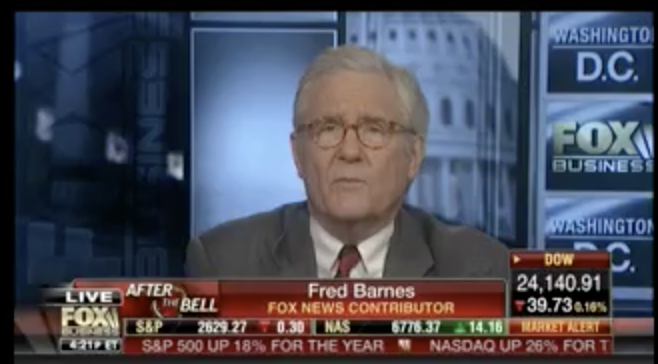 RUSH: Now, look, we like Fred Barnes here, but Fred, what was exaggerated? You know, this is one of those things, “Well, yeah. So you’re playing me a sound bite of Rush. Right. So I can’t fully embrace that without getting the Dershowitz treatment. So I’ve got to kind of pooh-pooh it, but I can’t disagree with it, ’cause it’s right. So what I’ll say is, ‘Well, he exaggerates a little bit. '” He did laugh there at the early part of the sound bite. When you or I or anybody use terms like “populated by Trump-hating,” that’s when they laugh, because establishment types don’t talk that way, even if they think it. “Trump-hating? That’s beneath our communication guidelines. We just don’t speak that way.” So they can’t endorse that kind of word assemblage, if you will. But the bottom line is that everybody in Washington knows what’s going on here. This boils down to some are willing to say it and some aren’t. I’m not talking about Fred Barnes. Fred got his digs in there, but it’s one of the problems that we have. I mean, the Mueller investigation is obviously a scam or a sham. The thing is based on a totally false premise, total absence of a crime. There is literally no… According to Justice Department regulations, there’s no reason for a special counsel, because there is no crime. RUMSFELD: It depends on who’s in the saddle in those countries and which one is more likely to make a mistake. My personal view is the fact that Trump… I don’t know President Trump. I’ve never met him that I can recall. But I certainly think that his demeanor in the presidency is a deterrent for those countries. He’s not tucked in and worried and cautious. He’s a bold leader, and he speaks his mind. RUMSFELD: — people sitting in the Kremlin and in Beijing seeing that are probably respectful of the fact that it’s not in their interests to engage in things that are disadvantageous to the United States. RUSH: This is big. Rumsfeld admits he’s never met Trump. Rumsfeld many would think would be of the crowd that would condemn Trump because he’s not an establishment guy; he doesn’t speak in diplomatic ways. But it’s just the exact opposite. “Bold demeanor… Not tucked in, worried, cautious. He’s bold. He speaks his mind and he leaves no doubt where the United States stands.” Like Mike Pompeo who is the CIA director. Somebody in the media trying to get him to admit that Trump’s tweets are a problem. And Pompeo said (summarized), “No, Trump’s tweets have actually helped us learn vital intelligence.” “What? What? What do you mean?” “Well, Trump will tweet something out about some of these wackos around the world and they’ll react to it, and when they react we learn more about them than we knew.” I’m telling you, Trump has got that town turned upside down in a lot of ways, and there are people unable to deal with that.